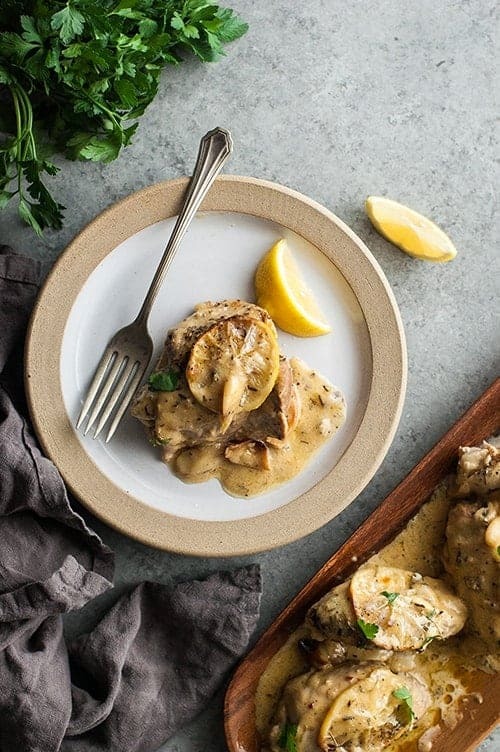 This Creamy Garlic Chicken Recipe is one of those recipes that once you try it, you’ll wonder how you ever made it this far in your life without this recipe. It’s perfect for a weeknight dinner when you want something you can throw in the oven while you get other stuff done. Or for a dinner party when you don’t want too much work, but want lots of flavor that’s sure to impress guests. I often double the sauce so there’s plenty to go over rice or noodles. I find that if I don’t, my kids and I are fighting over every last little bit of the sauce. I really prefer boneless, skinless chicken thighs in this recipe, but you could use chicken breast. Reduce the cooking time by about ten minutes. Just be warned that the meat won’t be as flavorful and juicy. Yes. I personally feel that all the fresh, whole cloves of garlic are totally necessary. My garlic sometimes gets overdone, like in the photo below, so sometimes I wait and don’t add them until the last 20-30 minutes of cooking. If you really like the lemon flavor, feel free to put all the juice from the lemon in this dish. Adding lemon zest to this dish really helps to up the lemon flavor without changing the consistency. I really recommend using heavy cream, or else the lemon will curdle milk or half & half. 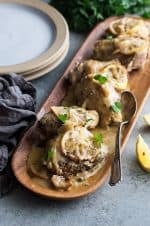 This recipe calls for dijon mustard, but I really like it with regular mustard too cause it gives it a little bit of a bite. Fresh herbs are really good with this too. Don’t be afraid to experiment with them and try different herbs. My favorites are fresh basil and fresh rosemary. And when using fresh herbs, you always need a lot more than with dry, because drying concentrates the flavor. 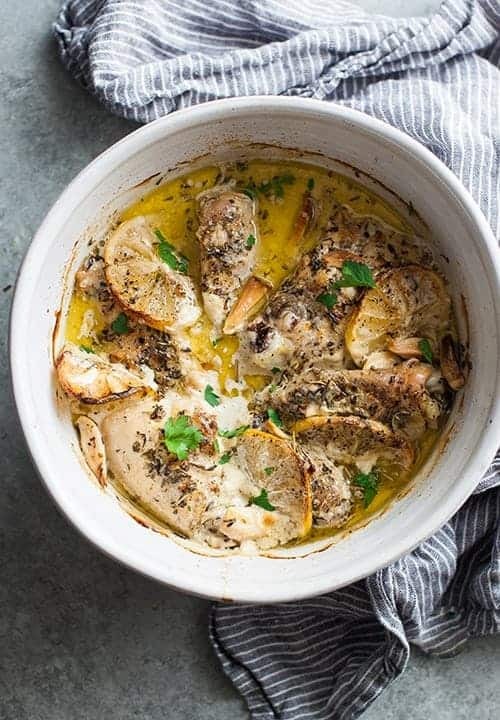 I would love to know if you try this Creamy Garlic Chicken Recipe and what you think of it and if you make any changes to the recipe. Please comment below! Lay the chicken thighs in a single layer in a baking dish. Sprinkle the garlic cloves evenly over the chicken. In a small bowl, whisk together the lemon juice, olive oil, mustard, Italian seasoning, rosemary, red pepper flakes, and salt. Pour the mixture evenly over the chicken. Sprinkle freshly ground black pepper over the top. Bake the chicken in the preheated oven for 40 minutes. Remove from the oven and pour the cream over the chicken. Place it back in the oven and bake for another 15 minutes. Cream should be bubbling and slightly thicker. 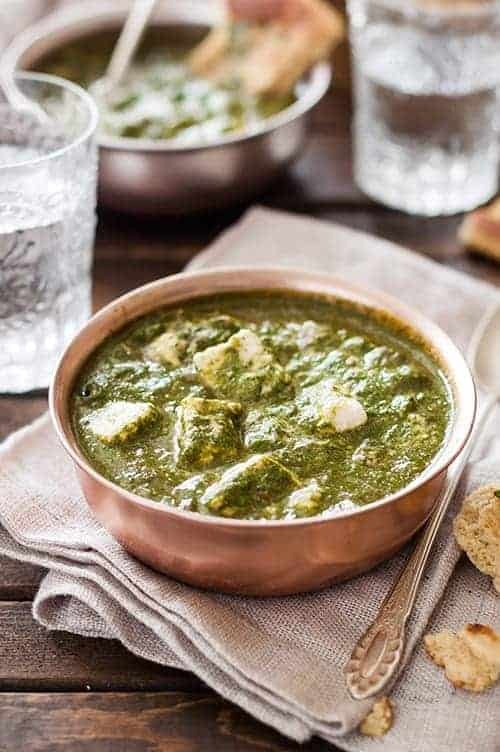 Chicken can be served as is (if doing so, add the butter to the sauce and stir until melted and combined, then serve), or, if a thicker sauce is desired, you can pour the sauce from the baking dish into a saucepan and bring to a boil over high heat. Let cook down for 2-3 minutes, or just until the sauce thickens to the degree you want it to and becomes glossy. Whisk the butter into the sauce until melted and combined. Pour over the chicken and serve. What would be a good healthy side? Sweet potatoes roasted? I like to throw something green in the oven while it’s on, like roasted asparagus, broccoli or winter squash and serve with something to mop up the sauce up with, like a baked sweet potato, mashed potatoes or rice. This looks real good to me, I want to try it soon. I love the flavors of lemon and chicken together.